"I am extremely unhappy with the Shiv Sena-BJP leaders’ decision to undermine RPI(A) in the 2019 Lok Sabha elections," said Ramdas Athawale. 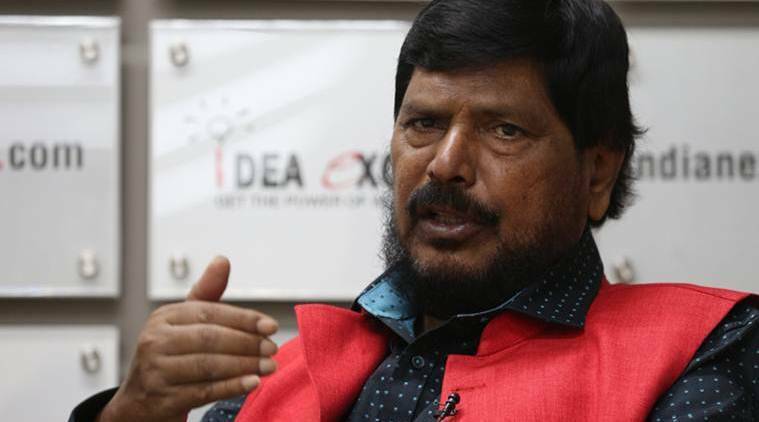 Union Minister for Social Justice Ramdas Athawale believes Republican Party of India(A) has got a raw deal in the Shiv Sena-BJP alliance in Maharashtra for the 2019 Lok Sabha polls. In an interview to The Indian Express, Athawale warns that the Dalit vote base should not be undermined by Shiv Sena-BJP across 48 Lok Sabha seats. Where does RPI(A) feature in the Shiv Sena-BJP alliance? I am extremely unhappy with the Shiv Sena-BJP leaders’ decision to undermine RPI(A) in the 2019 Lok Sabha elections. Of the total 48 Lok Sabha seats in Maharashtra, Shiv Sena is contesting 23 and BJP 25. They should have conceded at least one Lok Sabha seat to RPI(A). I had expressed my desire to contest from Mumbai North East or Mumbai North Central. Why have Shiv Sena-BJP overlooked RPI(A)? I had meetings with both Chief Minister Devendra Fadnavis and BJP president Amit Shah. The central leadership believes they went out of their way to accommodate me as a Member of Parliament in the Rajya Sabha in 2014. It was followed by induction in the Narendra Modi government as Union minister of state for social justice. I can understand their concerns and limitations. But they had also promised to accommodate two RPI(A) members in the State Legislative Council in Maharashtra. And accommodate both in the state government in rotation for six months each. But it is all on paper. So, are you planning to distance yourself from NDA? No. Any extreme step at this moment will amount to premature politics. I am just ventilating the anger of my followers not only in Maharashtra but also other parts of India. RPI(A) has taken the decision to support NDA. But I would like to warn the BJP-Sena not to take Dalits’ support for granted. Give us respect. Get our respect. This is our stern message. We are still demanding our right for one Lok Sabha seat. In the Assembly elections scheduled in October 2019, RPI(A) would seek at least eight seats. Both Sena and BJP should consider our demands from their respective quota. I firmly believe Sena-BJP alliance will continue in the state Assembly polls. How would you compare NDA 2014 and 2019? In 2014, they had given four seats to smaller allies – RPI(A) contested from Satara, Swabhimani Shetkari Sanghatna got two seats, Hathkanangale and Madha. The Rashtriya Samaj Party contested from one seat, Baramati. Of the four seats, only Raju Shetti won from Hathkanangale. Yet, I am insisting on at least one seat to keep the morale of my followers high. They get the sense of belonging. I am not against Modi or Fadnavis government which has conceded to all our demands such as Ambedkar memorial at Indu Mills in Mumbai, Ambedkar international centre in London, strengthening of the Atrocities Act, among others. Do you perceive a political challenge from Vanchit Bahujan Agadhi led by Prakash Ambedkar? Not at all. My Dalit vote base will remain intact. My friend Prakash Ambedkar has formed a new political front and is drawing good public response. But whether the public support will translate into electoral seats remains to be seen. I don’t think he will succeed in winning seats. He will cut into Congress-NCP vote base. Ambedkar’s politics will work to Shiv Sena-BJP’s advantage. What more steps should be taken to stop atrocities against Dalits across the country? There cannot be any tolerance for even a single instance of atrocity against Dalits. Therefore, we fought and ensured the Scheduled Caste and Scheduled Tribe Prevention of Atrocities Act was not diluted. Did Congress-NCP approach you to join their Mahagathbandhan? I have always received an open invitation from Congress-NCP. But we cannot forget the ill-treatment meted to us by Congress-NCP in the past. It was Congress which plotted my defeat from Shirdi in the 2004 Lok Sabha polls. After the humiliation, I took a decision after adequate consultation within my party to have an alliance with Shiv Sena. The late Bal Thackeray had given a call for Sena-RPI(A) alliance through Bhim Shakti-Shiv Shakti. In 2009, RPI(A) decided to align with the BJP-led grand alliance in Maharashtra. Another reason for shunning Congress-NCP is, they always used us as votebank. Whereas, Modi government has been more responsive in addressing the policies or projects which help in uplift of Dalits. Take the example of Standup India, which promotes Dalit entrepreneurship or housing under PMAY. What about ideological differences with RSS? I admit there are some issues where we have differences with RSS. But if we look at Indian politics both at the Centre and state there are no untouchables. In the 1970s, Janata Party had an alliance with Jan Sangh and they came to power against Congress. How will you reconcile the differences? RPI(A) has an alliance with BJP-Sena. It is part of NDA. In the election manifesto, we will insist that BJP mentions that the Indian Constitution will not be changed and Scheduled Caste, Scheduled Tribe and Other Backward Caste (OBC) reservation will remain intact in future. They should also consider our demand for five-acre land to landless Dalits.